The Cuba national baseball team is the national team of Cuba. The team is made up from the most professional players from the Cuban national baseball system. Cuba has been described as a baseball powerhouse and currently ranks 5th in WBSC's world rankings. It has medalled in all five Olympics in which baseball was played. Cuba played in the 2017 World Baseball Classic. 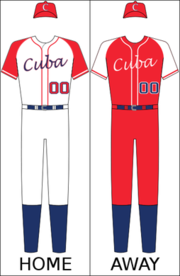 Cuba participated in the inaugural World Baseball Classic tournament, though there was controversy over Cuban involvement, due to the United States embargo against Cuba. Cuba reached the finals of the tournament, but lost in the final to Japan by a score of 10-6. Cuba again participated in the 2009 World Baseball Classic, playing its first round games in Pool B at Foro Sol in Mexico City. Cuba advanced to the second round with wins over South Africa and Australia. However, they lost to Japan twice in the 2nd round, and were eliminated. It was their first elimination before the finals in an international tournament since 1951. For the third time ever, Cuba participated in the WBC, this time in the 2013 World Baseball Classic in Pool A in the Fukuoka Dome in Fukuoka, Japan, facing off against China, Japan, and newcomers Brazil. The Cuban team beat all three teams to proceed to the second round in Pool 1 to face off against the Netherlands, losing 6-2 in the first preliminary round. They played Chinese Taipei, winning 14-0 to face off against the Dutch team once again, but lost 7-6, thus eliminating the Cuban team from reaching the finals for the second time. Cuba participated in the 2017 World Baseball Classic. Cuban hitters Frederich Cepeda and Alfredo Despaigne had each hit six home runs in the WBC in their careers, tied for the most in World Baseball Classic history. The team had a 2-1 record in the first round. It was led by slugger Despaigne, who took over as the all-time WBC home-run leader. Team Cuba advanced into the second round, where it lost its first game to undefeated Pool A winner Team Israel. Former Major League starting pitcher Jason Marquis (in 5.2 innings) and three Team Israel relief pitchers (including Brad Goldberg and Josh Zeid, who both threw 96 mph fastballs) kept Team Cuba to five hits and one run, a homer by Despaigne, who became the all-time World Baseball Classic home run leader. Pool A MVP catcher Ryan Lavarnway had two hits for Israel. Cuba went on to lose all 3 games they played and failed to advance to the championship round. The Cuban team has participated in every Summer Olympic Games since 1992. It has been the most successful team at the Olympics. In the five tournaments contested, they have won the gold medal three times, and the silver twice. Gold: Won Gold 14 out of the 17 Central American and Caribbean Games. ^ "Baseball World Cup big news in Cuba, no matter the outcome". CNN. 2009-09-28. ^ a b "World Baseball Classic: Israel continues to shock the world, beats Cuba 4-1," Haaretz. ^ "Blue-and-white takes on Cuba in Tokyo," The Jerusalem Post. ^ "Despaigne's grand slam sends Cuba to second round of WBC," The Japan Times. ^ a b "Israel beats Cuba to stay unbeaten in WBC '17". Retrieved 12 March 2017. ^ "Jason Marquis on dominant run in WBC '17". Retrieved 12 March 2017. ^ "Josh Zeid leading Israel's strong bullpen". Retrieved 12 March 2017. ^ "IBAF announces groups for first round of 2009 Baseball World Cup" (PDF). Archived from the original (PDF) on 2009-03-24. Retrieved 2009-03-15. ^ "IBAF World Cup 2009 in Europe". Archived from the original on 2009-03-24. Retrieved 2009-03-15.